This Amaretto Christmas cake is packed full of juicy Amaretto soaked fruit for a perfect festive celebration cake! 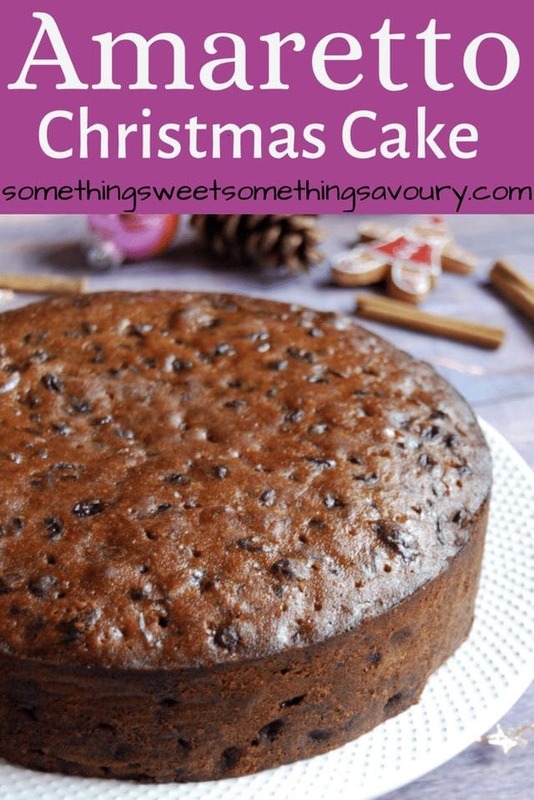 Since tomorrow (25th November) is stir up Sunday in the U.K, I thought it would be the perfect time to re-share my Christmas cake recipe with you all. I came up with this recipe a few years ago and it has become my go-to celebration fruit cake recipe. 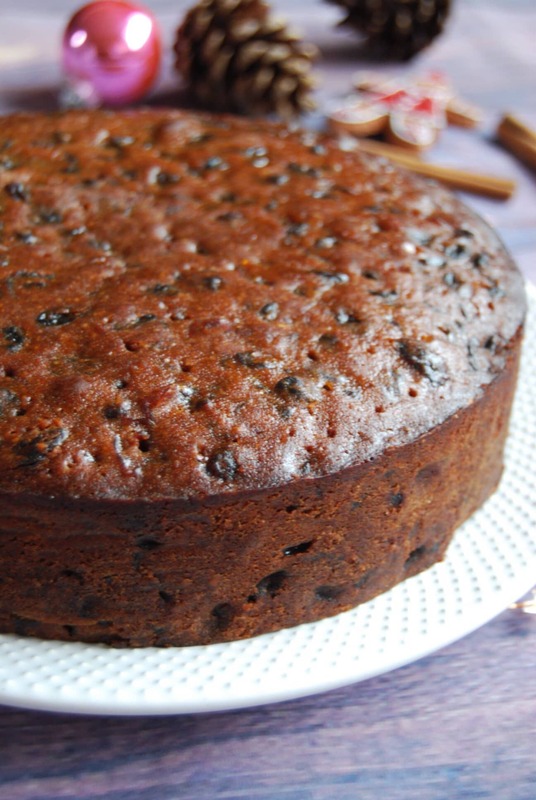 I just can’t imagine Christmas without a fruit cake – if I’m totally honest one of my main reasons for making one is to fill the house with the amazing, festive smell while the cake is in the oven. If you could buy a scented candle of that spicy, warm aroma, I would stockpile them. 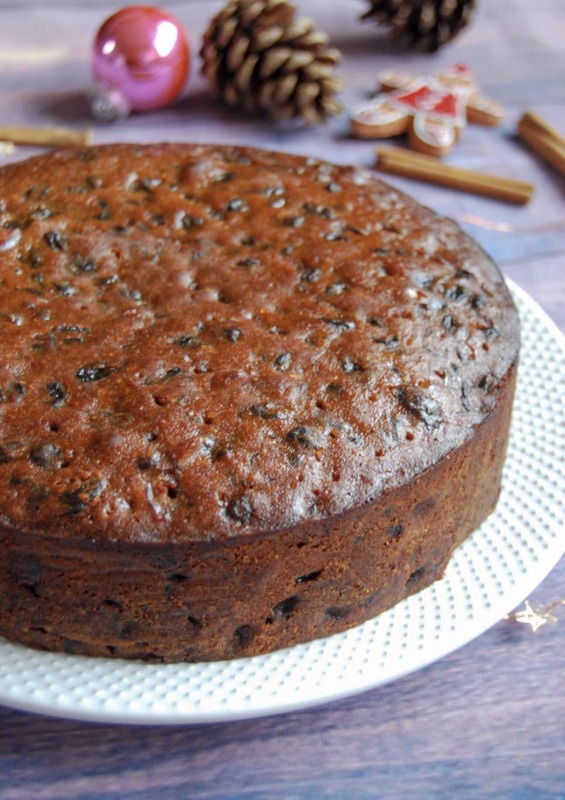 The making of this fruit cake starts on the hob – dried figs, prunes or dates, raisins, sultanas, cherries, orange zest and mixed spice is simmered in Amaretto and left to soak for a while – I often leave it overnight – which in my opinion and experience produces the same results as soaking fruit in alcohol for several days or even weeks. I usually make elaborate plans to ice and decorate the cake, but in reality I’m never usually organised enough to actually do it. If you’re short of time, a fruit and nut topping is very easy and looks pretty. All you need to do is brush the top of the cake with warmed apricot jam and decorate with the fruit and nuts before brushing them with more apricot jam for a shiny glaze. 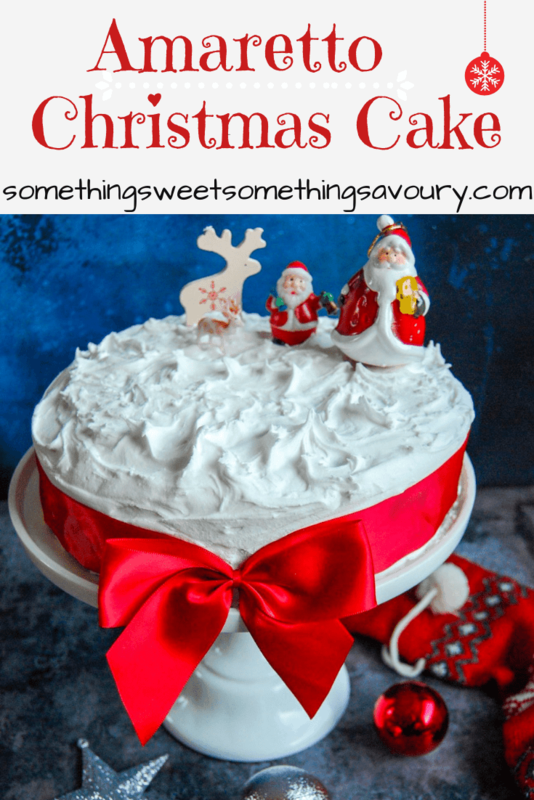 I’m also sharing this Christmas cake with #BakingCrumbs, the monthly baking link up hosted this month by Jen at Apply to Face Blog. 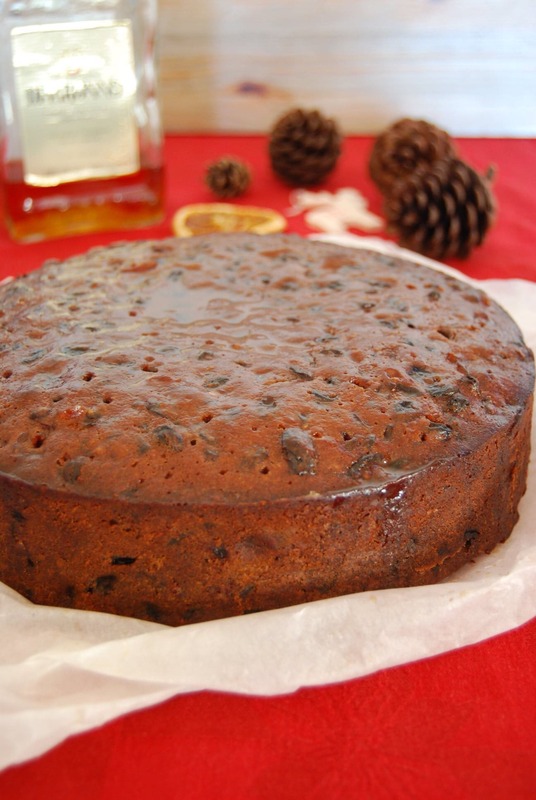 A rich, moist fruit cake filled full of juicy fruit and a generous amount of Amaretto! This is my favourite Christmas cake recipe. Preheat the oven to 160C/140Fan/300F/Gas Mark 2.It's definitely worth taking the time to line your cake tin correctly to protect the cake during its long baking time. Grease a loose bottomed 23cm round cake tin (10cm deep) and line the base and sides with non stick baking paper. Cut out a circle of baking paper, using the base of your tin as a template. To line the sides, cut a strip of baking paper a little longer than the circumference of the tin and about 3 inches higher. Fold it 1 inch along its length, then using scissors make little snips up to the fold line, making a fringe along the length. It should now fit snugly inside the cake tin. Finally, fit your circle over the top, covering the fringe. Place the dried fruits in a large saucepan with the Amaretto, butter, sugar, Orange zest and juice, lemon zest, treacle, cinnamon, mixed spice and nutmeg. Gently bring to a simmer, stirring, for 10 minutes. Remove from the heat and let the mixture sit for at least 1 hour. I've often done this in advance and left it overnight. When you're ready to bake the cake, pour the soaked fruit mixture into a large mixing bowl. Add the eggs one at a time, then stir in the flour, baking powder and ground almonds. Stir until everything is well combined. Pour into the lined tin and bake for 2-2 1/2 hours or until the cake springs back when lightly pressed and a skewer inserted into the middle of the cake comes out clean. When the cake is completely cold, poke a few holes in the cake, drizzle with a little Amaretto, then wrap in a double layer of baking paper and foil and store in an airtight container. What a stunning looking Christmas cake! Well it smells delish! Can’t wait to taste it in a couple of weeks. What a beautiful Cake this is. I adore the shape of her. Love the sound of the Amaretto too and the shortcut of warming your fruit in a saucepan. These sort of bakes just make Christmas. Thank you for sharing with us at #Baking Crumbs. Hi Jacqui, I hope you enjoy it! ? I think it’s such a brilliant idea to add amaretto to a Christmas cake as it’s such a Christmassy spirit. I’d love to try your cake as it sounds so scrumptious! Thank you Jenny! I first read about this trick in a Nigella book and I haven’t looked back since. It’s a great timesaver.